In Dolphin R6252 doesn't work "Dolphin wiimote new" plugin in next games: The last story and Project zero 2. Here in a bottom of emulator's window placed text "not connected", games doesn't recognised wiimote too. 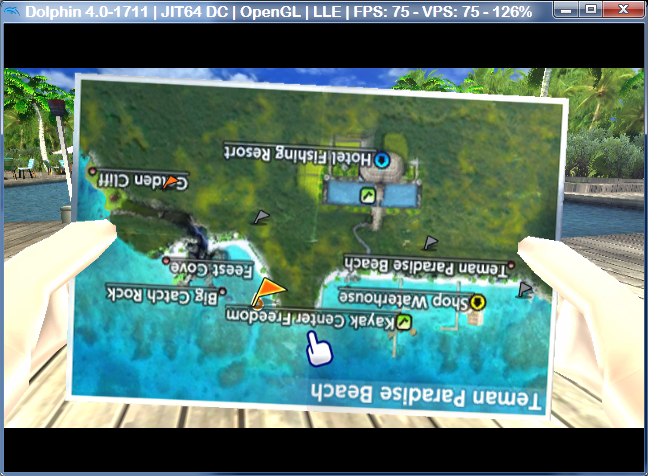 In another wii games plugin works correctly. How solve this problem? Like it says, you can use outdated builds, just don't expect any support for them. It's recommended that you use 3.5 or the latest git releases. Even if you insist on using old builds, something like 3.0 might not even have these Wiimote issues. New revisions doesn't support my GPU. I have no alternatives, so I use old revision. And I noticed, that old revision works better, then newest and official: most part of games runs fullspeed. Quote: And I noticed, that old revision works better, then newest and official: most part of games runs fullspeed. If by better you mean "faster on my crap hardware", then sure. Dolphin doesn't strive for performance, it pursues accuracy. That tends to slow things down. If an old build works for a specific game on your old system, that's great. But you are going to run into problems that don't exist in the latest version. Like wiimotes not working on brand new games. Could you at least try 3.0? Also... you are trying to run The Last Story, the most demanding wii game there is, on an Athlon II X4 @ 2.8ghz? Wow man, good luck with that. after that words? If you didn't satisfied by my specifications, you may buy hi-end computer for me. And you will be surprised, but I completed Last story twice on Dolphin 3.0, but since strange moment, emulator doesn't support my GPU. MaJoR's no brat, he's got valid points. TLS is a ridiculously demanding game, and old revisions are gonna have issues everywhere. Theoretically, though, your GPU should be fine for even the latest Dolphin revs; it supports everything MaJoR's GPU supports. Have you never updated your drivers or somethin'? (02-03-2013, 08:54 PM)pauldacheez Wrote: Have you never updated your drivers or somethin'? (02-03-2013, 08:54 PM)pauldacheez Wrote: yes, I have. But I have no problems with perfomance, only that my video card is not entirely supported. And so I must use older revisions, that have a problem with wiimote. In last resort use an emulated Wiimote for these games. This isn't the best deal but at least you'll be able to play your games. Btw have you tried to use Alt + F5? Your Wiimote might've disconnected as you launched your games. (02-04-2013, 10:56 PM)LordVador Wrote: Btw have you tried to use Alt + F5? Your Wiimote might've disconnected as you launched your games.